Our English ancestors brought us the fruit pies. They added a topping of biscuit dough to them and placed a heavy lid on top so that the biscuit dough could rise and brown, that’s how the cobbler was born. Today in the South, most of the restaurants and the Barbecue restaurants have peach cobbler on the menu. 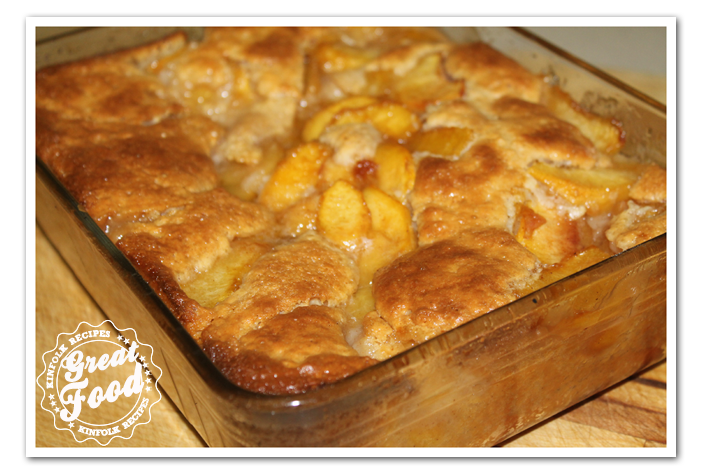 A Peach cobbler is as American as Apple Pie, it is a tradition and one that I have come to love. 2. 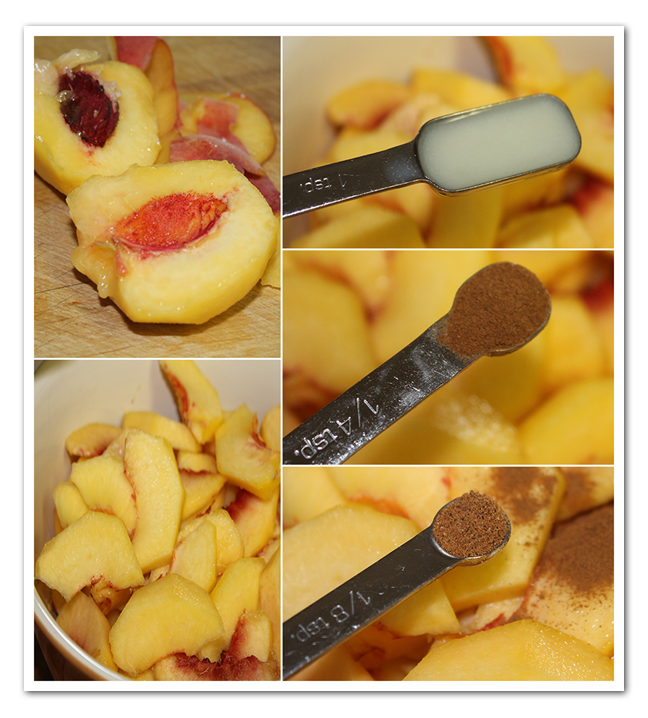 Combine the sliced peaches, lemon juice, cinnamon and nutmeg in a bowl 3. Stir sugar and water together in saucepan pan over medium heat until simmering, 2 to 3 minutes. 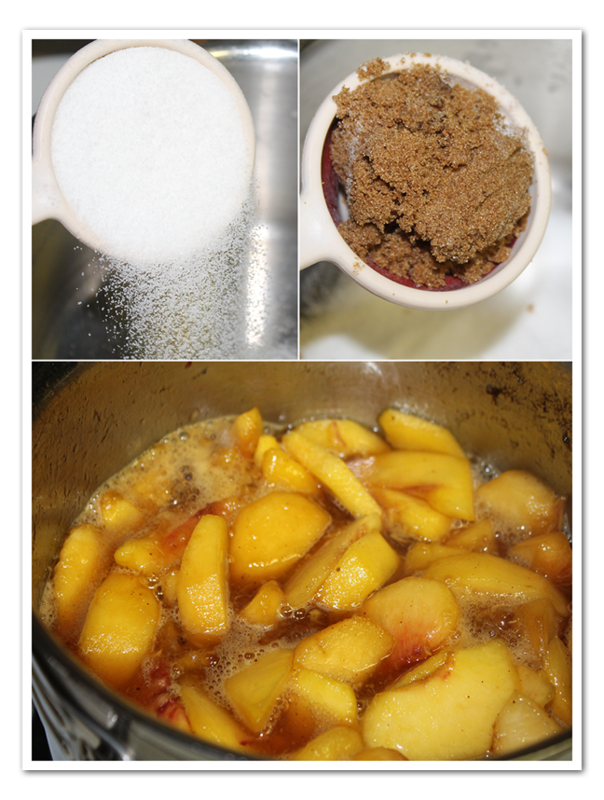 Stir in peach mixture; cook and stir for 2 minutes. Remove from heat and set aside. 4. As for me I don’t like it overly sweet. If you like your cobblers sweet add an additional 1/2 cup of sugar to the syrup. 5. Combine sugar and self-rising flour in a large bowl. Pour in the milk and cinnamon; whisk to form a smooth batter. You have to use self-rising flour because if you use regular flour the batter won’t rise to the top. 6. Pour melted butter into the baking pan. Pour the batter over the melted butter. 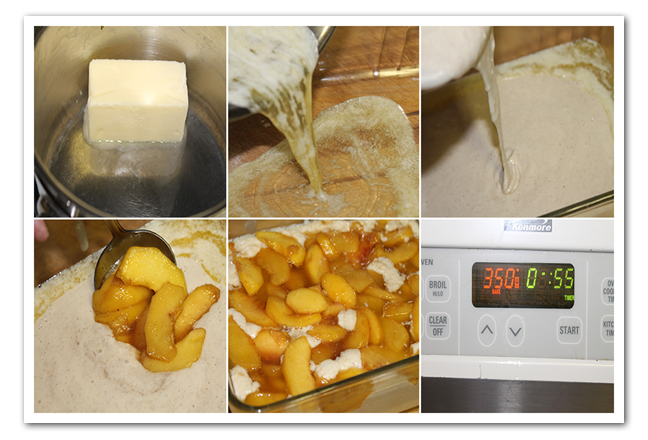 Gently place peaches and syrup on top of batter. As the cobbler bakes, they will sink down into the batter. Bake until syrup is bubbling and crust has risen and is golden brown, about 50-55 minutes. Stir sugar and water together in saucepan pan over medium heat until simmering, 2 to 3 minutes. Stir in peach mixture; cook and stir for 2 minutes. Remove from heat and set aside. As for me I don't like it overly sweet. If you like your cobblers sweet add an additional ½ cup of sugar to the syrup. Combine sugar and self-rising flour in a large bowl. Pour in the milk and cinnamon; whisk to form a smooth batter. 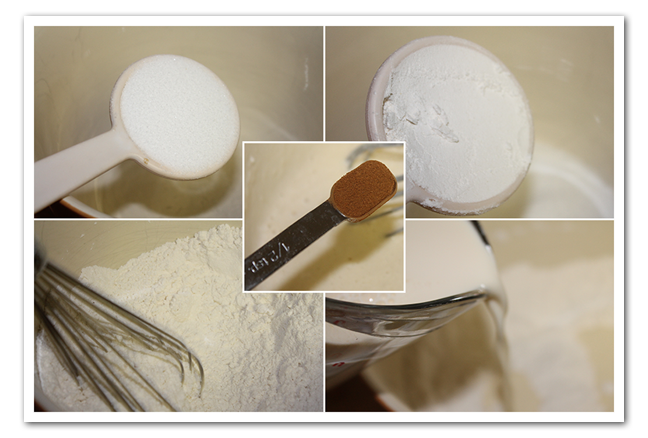 You have to use self-rising flour because if you use regular flour the batter won't rise to the top. Pour melted butter into the baking pan. Pour the batter over the melted butter. Gently place peaches and syrup on top of batter. As the cobbler bakes, they will sink down into the batter. Bake until syrup is bubbling and crust has risen and is golden brown, about 50-55 minutes. What size pan does this cook in?!?! Can frozen peaches be used? If so, how many cups would you suggest? I love the recipe, it is simple. I will try, and if I like tase my I fill it for my us?